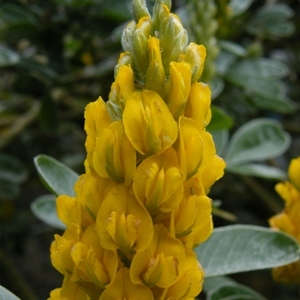 The two common names for this plant are equally accurate – Moroccan broom or pineapple broom does indeed come from Morocco and does indeed smell of pineapple. To complete this appealing picture the flowers also bear a passing resemblance to a pineapple in shape, albeit longer and narrower and of course a pineapple is a fruit not a flower! Tolerant of very dry and poor soils it does however need some protection or heat from a south or west facing wall to thrive in the Midlands. Given a suitable spot it will delight you with silvery hairy foliage and sweetly scented bright yellow flowers in mid-summer. It is a little tempremental, not liking too much lime and is better not pruned into old wood. Its pleasures however outweigh the drawbacks and it is well worth its space in a warm corner of the garden.